I’m On the Honey Nut Cheerios Box! 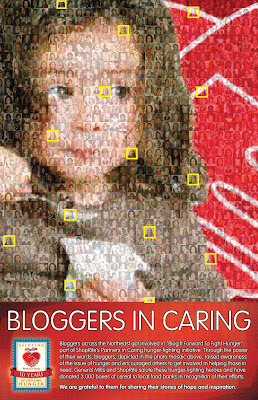 Back in August I participated in a special program call Bloggers for Caring. It was an initiative in conjunction with Shoprite that helped bring awareness to hunger issues and how you can help. I was honored to have been asked and was happy to participate. An added benefit to the blogging program was that Shoprite and General Mills donated 3,000 boxes of Cheerios to food banks in the Northeast, where Shoprite stores are located. Being part of such a great program was thanks enough. 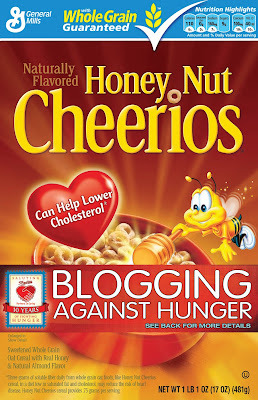 But General Mills and Shoprite decided to honor the bloggers that participated by putting them in a photo mosaic on a special edition box of Honey Nut Cheerios. This box is available THIS WEEK at Shoprite locations. Can’t find me? Check it out now-I’m there 13 1/2 times! Go ahead, click the pic-it get’s bigger! I am happy to have participated by donating my post and writing to the cause! So go get a box for yourself. Support Shoprite and General Mills for making great community minded decisions and creating programs such as the Partners in Caring program that I first wrote about! Check back tomorrow for a post on how YOU can be on a special edition Cheerios box coming out this fall! Congrats! I figured you have to win the Olympics to be on a box of cereal… or maybe that's just Wheaties…. Anyway, yay! That is awesome… thanks for pointing out your photos! I was at SR yesterday and spotted your photo right away! Very cool! Such anawesome cause too. First Martha now CHerrios….are we going to see you in People Magazine next??!?!?! You're a ROCKSTAR! On the bottom far left side one, I'm the picture directly above you! !